A Welsh girl in Australia: 'Out of date' or 'vintage'? 'Out of date' or 'vintage'? I hadn't been that way for a while and spent a pleasant couple of hours browsing. I wasn't looking for anything in particular, but you know the story, you can't come away from those kind of places empty handed and so these little glasses found a new home. They should really be filled with Babycham, but for the time being I think they make very pretty tea light holders. I decided that I needed a coffee break and made my way to the lovely little vintage style coffee shop in the centre. I found a spot to sit amongst the coach trip of elderly ladies,- (my goodness they could chatter!) After a while, I thought it would be nice just to read and enjoy my drink, so I turned to ask the (bored looking) bus driver if he wouldn't mind passing me a magazine that was in a pile next to his table. 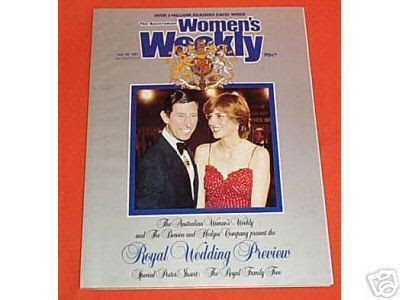 With a dead pan face he mumbled, "They're out of date"
"That's okay", I replied "I don't mind"
"No" he said, "they're REALLY out of date"
The Australian Women's Weekly was 1981! Of course it was 'out of date'- we were in a vintage coffee shop in the antiques centre! Unfortunately for the bus driver I had the giggles....and I had to pretend that the articles about Charles and Di were extra funny to cover up the fact that his comment had really tickled me! Hi!Lucky me...finding you via y friend Maureen! So, I follow you from Rome and, you know, I'm one of those who adore vintage stuff!!!! I just made a link to you, have a good day! I love these glasses. What a fun find.